Looking west along Weber St., the depot will be where the cork rectangle is location with city structures along the left and the Stockton Channel on the right (depressed area). A San Francisco river steam will be docked here eventually. The engine terminal and yard is at the extreme west end of the railroad. The Crown Flour mill will be where the paper drawing is with the Stockton Channel on the right. After leaving Stockton, the railroad arrives at Orford Jct. where the Moraga Springs Northern Railway joins the S&C. An interlocking plant is installed here to monitor the traffic. The small shelves also have a fast clock for operation. The telephone train line is beyond. Holden is the junction of the Stockton & Ione and the S&C. The narrow-gauge S&I tracks are in the foreground with the S&C in the background. Fruit packing houses will line the track along the wall as the mockup shows. At the east end of Holden, the S&I shares a bit of track as it crosses Mormon Creek (on the left out of picture). The operator's desk with train order signal controls is located beneath Holden. Peters, junction point of the Milton branch with the main line is on a narrow peninsula. Looking down the next aisle reveals Farmington at the end. Farmington is a typical small town with grain warehouse, produce packer, winery and agricultural implement dealer. The Stanislaus River is crossed south of Farmington. Burnett's (far left) is just a siding with a corral and grain warehouse. The tracks arrive in Oakdale and wind past the Soda Works and Stanislaus Milling Company. The coal dealer is on the right. An overall view of Oakdale shows most of the town and the businesses along East Railroad Avenue. The depot is in the center of the photo with the engine terminal alongside the tracks. A grain warehouse, lumberyard and other industrial buildings make up the south end of Oakdale. The main line goes into the staging yard between two of the large buildings against the far wall.. The short divider hides the tracks from casual view but allows access to the tracks if needed. Milton was once the end of the prototype branch but, on my railroad, it continues on to Copperopolis. The 2% grade to Copperopolis begins at the far end of the town. Felix has a gold refining mill which receives coal and ships concentrated ore. The headquarters for the Tower Ranch are here and they will have a small loading platform. After leaving Felix, the railroad crosses the Keystone Ravine. 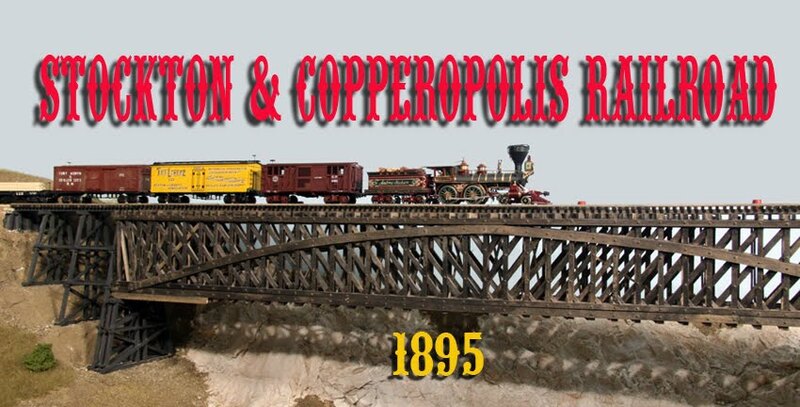 At Copperopolis, the railroad serves the copper mines and has a small engine terminal. I really like what you are doing, especially the time period, CP/SP square water towers, and the wagons. If you have not seen it, take a look at the Contra Costa Historical Society picture of the water trough at Brentwood.